Bolton come to Bloomfield Road in a poor run of form having lost their last three games, whilst Blackpool will have taken great heart from a strong showing against Spurs last week. 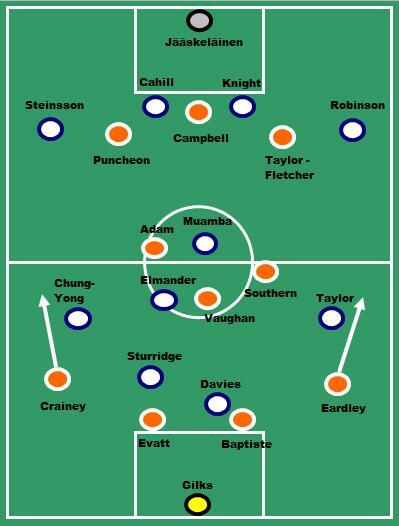 The positioning and application of Johan Elmander could be pivotal?? Ian Holloway has a fully fit squad to choose from, but may well opt for giving Jason Puncheon a start over Sergei Kornilenko upfront. Last week against Spurs, Puncheon looked better on the ball and understand his running patterns much better than Kornilenko and certainly seemed to link up well with DJ Campbell. For Bolton, Owen Coyle is likely to use the same eleven that lost at home to Sunderland last week, however, Bolton’s shape may be hard to call. The reason behind this is the arrival of Daniel Sturridge and the injury to Stuart Holden which has led to a slight change of shape. When these two sides met back in November Coyle favoured a standard 4-4-2, however, he likes to utilise both Elmander and Sturridge in addition to their captain Kevin Davies. The upshot of this is that when the team is being more aggressive they show a clear split in attack and defence as shown by their average positions from the Sunderland game. In that game Coyle asked Muamba and Elmader to form more of a diamond formation. An aggressive move, but it might be a step too far for an away game against an attacking Blackpool side. However, as they sit tighter and defend as they did for large periods against Arsenal they hold average position much more akin to a standard 4-4-2 with Johan Elmander sitting in central midfield alongside Fabrice Muamba. Elmander (9) can sit tight as well as push higher up and adapt to game circumstances. Diagrams courtesy of http://www.whoscored.com. However, that tends to be Coyle’s play at home and away from home he tends to field Elmander wide right favouring Mark Davies (injured for this game) or Tamir Cohen in central midfield or another option (Ricardo Gardner at Blackburn). Would it be a risk to field Elmander centrally? If Coyle thinks that, then Cohen will possibly start if fit. Stuart Holden has been of vital importance to Bolton this season with his energy and mobility to move around the pitch offering passing options, but more importantly to close down the opposition and win ball. 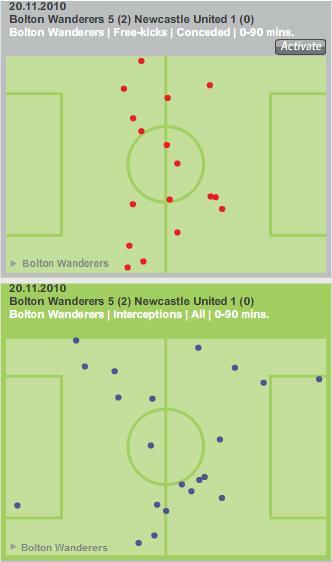 Without him in the midfield Bolton have looked exposed, non more so than when these two teams met at the Reebok back in November. 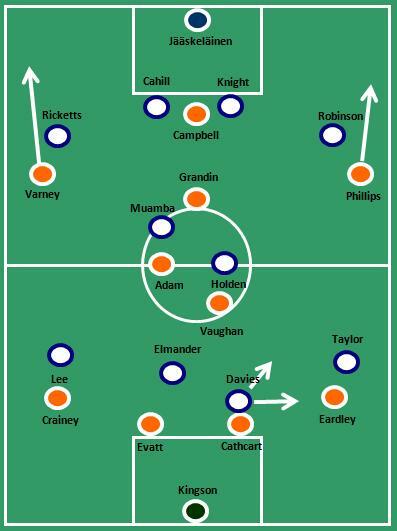 Blackpool found it very easy to play through Muamba and Mark Davies with Elliot Grandin often finding a lot of time and space to build attacks. 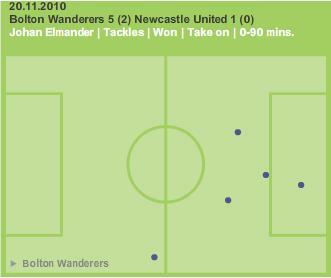 Holden had average 4.5 tackles per game and with Muamba chipping in with 3 per game they formed a strong combination. Since Holden’s injury Coyle’s midfield selection has been varied and it appears that no one has replaced Holden’s tackle contribution and the upshot of this is that Bolton lack that bite they once had. As much as Stuart Holden helped to bond Bolton’s midfield, then Daniel Sturridge has been excellent since coming in from Chelsea. 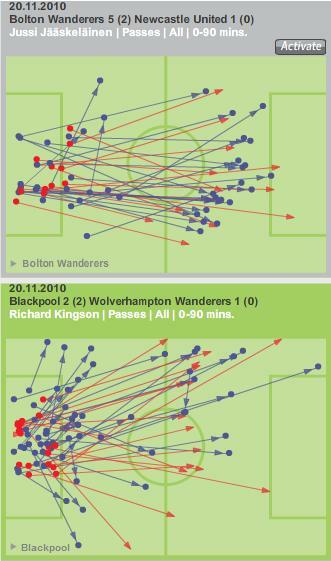 Looking at Bolton’s attacking statistics, he starts to dominate the key areas such as shots per game, dribbles and most importantly goals. With 7 goals since his arrival he will shoot on sight and should Bolton score in this game, then it’s very likely that he will be the source. He favours his left foot and should the ball not settle naturally on that foot then he will seek to get the ball to his left before releasing his shot (5 of his 7 goals have been scored with his left foot). Holloway may well ask Alex Baptiste to pick him up as he advances and try to steer him wide and away from goal whilst trying to stop him getting the ball on to his left foot. Last time out Ian Evatt picked up Kevin Davies and coped admirably, and he has been in good form of late as Blackpool have attained a more robust defensive line. In the last three games against recognised strong aerial teams (Newcastle, Stoke & Spurs) he has managed to win 57% of his aerial duels. If he can replicate that level of performance against Davies then that will go a long way to putting Blackpool in a strong position. With the return of Matthew Gilks in goal and the move of Alex Baptiste to centre back Blackpool look more resilient defensively. Evatt and Baptiste seem to work better together as a partnership as Baptiste has the pace to act as a cover whereas Craig Cathcart is perhaps too similar to Evatt and has also made three errors leading directly to goals being conceded and points lost. Some observers have made the comment that Bolton are already on their holidays, however, it would be surprising if that really is the case. Bolton will battle hard for every ball and Daniel Sturridge is playing like he wants to prove a point to Chelsea or perhaps a prospective new employer. Blackpool know that they must win this game to have a realistic chance of survival, should they fall short here then it won’t be because Ian Holloway has tried to defend. Expect an all out attacking performance from his team.